We’d love your help. 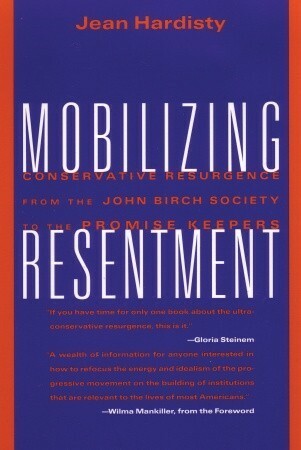 Let us know what’s wrong with this preview of Mobilizing Resentment by Jean Hardisty. Jean Hardisty, draws a map of the political battles now being fought in America and offers lessons for progressives confronting, combating and constructively engaging the Right in more productive ways. To ask other readers questions about Mobilizing Resentment, please sign up. This book suffers from two problems, first, the author’s continuous use of ‘I’ starting too many sentences, and the missed opportunity of giving historical perspective that dates the book. It is perfectly fine to be an authority, but Jean Hardisty, like Richard Dawkins, inserts herself too deeply in the subject, moving the focus away from the content. This book was written in the 1990’s and will remain relevant mostly to people that read it at that time, like most pundits it’s a sociological stu This book suffers from two problems, first, the author’s continuous use of ‘I’ starting too many sentences, and the missed opportunity of giving historical perspective that dates the book. It is perfectly fine to be an authority, but Jean Hardisty, like Richard Dawkins, inserts herself too deeply in the subject, moving the focus away from the content. This book was written in the 1990’s and will remain relevant mostly to people that read it at that time, like most pundits it’s a sociological study more than a historical study, and makes many assumptions based on the authors belief without backing it up in the text. For examples she equates the Christian Coalition movement of the 1980’s with the Republican Party’s “Southern Strategy”, then simply moves without pointing out the specific similarities. Daniel Schulman’s ‘Sons of Wichita’ did a more complete job of tracking the history of John Birch to Promise Keepers than this book. A missed opportunity. Obviously well-researched, but sloppy, scatter-shot writing. A real chore to read. Didn't finish.